The set is a key component of any television show. It’s a sometimes subtle, yet always vital backdrop upon which the characters play out their story. After all, what would Nickelodeon’s School of Rock be without a classroom setting, musical instruments and preppy school uniforms? “Our sets are works of art,” said Patrick Garney, senior director of production for live-action series production at Nickelodeon, where he has worked since 2002. Nick, like other Viacom brands, reuses these painstakingly designed sets wherever it can, so the keen-eyed may notice items from sketch-comedy classic All That tucked into the background of the network’s newer shows. If outdated items cannot be re-purposed for one of the aforementioned categories, the last resort is to send them to the Dumpster. But Nickelodeon employees from various departments have worked to insert another option for old sets: donating the facades, along with any other useful material—props, hardware, etc.—to theater departments at Los Angeles public schools and select charities, an extra step that benefits not only the community and the environment, but, by cutting down on disposal fees, Nickelodeon and Viacom. Lee Ann Larsen, executive vice president of production and live action for Nickelodeon, was impressed by the concept when a member of Garney’s team first pitched it to her. The set wall-recycling project’s first beneficiary has been the Los Angeles Unified School District. 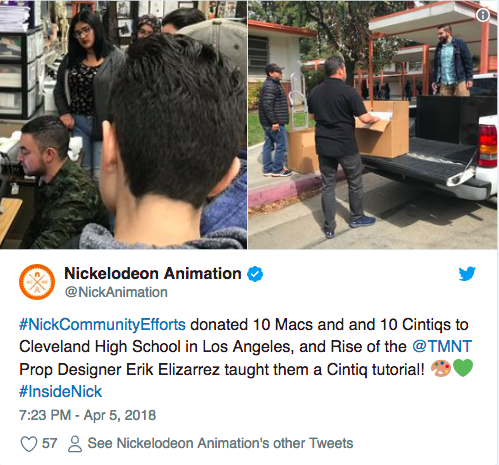 Nickelodeon has worked with this school in the past to donate outdated yet functional production equipment: monitors, cameras, computers, tablets and more. Nickelodeon employees also volunteer their time, providing demos to teach kids how to use video-editing programs such as Avid or Premiere. The equipment and sets have been especially welcome in these low-income schools, where theater and arts programs are not always prioritized. The dedicated staff are as meticulous in their deconstruction of these sets as the folks who create them, ensuring that students attending theater classes at local public high schools get to perform using state-of-the-art, professional backdrops from popular Nickelodeon shows such as Nicky, Ricky, Dicky and Dawn, The Thundermans and School of Rock. By rerouting sets destined for the trash to those who could use them, Nick also ends up saving quite a bit of money, since disposal of these items is costly. Take, for example, the parents’ bedroom set on Nicky, Ricky, Dicky and Dawn, which would have cost nearly a thousand dollars to demolish. By donating the set walls to schools lacking theater resources – and the bedding, blankets and other accouterments of a master bedroom to local charities, the company cut this demolition cost in half. The set wall-recycling effort echoes another passion project generated by Burbank employees, involving recycling of disposable products with reusable mugs and glasses at Nickelodeon’s Burbank office, that does a larger public good while saving the company money.